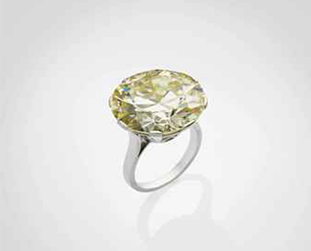 A yellow diamond ring joined the list of the most expensive diamond rings in the world, when it was sold for US $623,000 at the Christie’s Paris Jewels Sale held in Paris on 6th June 2012. Yellow diamonds are very rare, and it is this rarity which ensures that they garner top prices in jewellery auctions held across the world. This yellow diamond is a round 26.10 carat gem, which is brilliantly cut and throws light in amazing sparkles. Picked up by an unnamed buyer, it is set in a simple platinum ring, and could make a great gift for a millionaire’s wife or girlfriend. With the yellow diamond ring becoming a top seller at the Christie’s Paris Jewels Auction, coloured diamonds have returned to the spotlight, and are expected to collect higher prices at jewellery sales in the future. Have you ever owned a yellow diamond ring? Do you plan on buying one in the future?